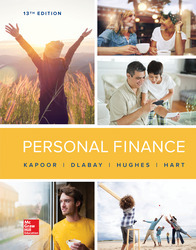 Personal Finance provides the information needed to help students plan for the future and achieve financial security. Updated and revised important topics like taxes, college loans, health care, and investments to provide the most current information available. Connect: A reliable, easy-to-use homework and learning management solution that embeds learning science and adaptive tools to improve student results.